Based on gender, height and weight the program determined that this person’s head weighs about 14.4lbs. It was found that their head was carried forward approximately 1.12” which effectively makes that 14.4lb. head put as additional 16lbs of stress on the body. 16lbs. every day for years will cause remodeling of the spine, degeneration/arthritis. If we find issues that need further investigation, then we will take digital x-rays, so we can get a clear look and the position and condition of your cervical spine. Some of the things we look for in the x-rays is alignment from front to back, which should be relatively straight and alignment from the side which should be a nice even curve. We will also look at discs (which are the spacers between the vertebra) and the vertebra themselves for any evidence of arthritis/degeneration. This is valuable information as it helps us get an idea of how long you have had this problem and it is critical for our treatment recommendations. Some of what we base our recommendations on is the Phase of degeneration your spine is in. There are three basic phases of degeneration; Phase 1 – Alignment issue, but no signs of arthritis/degeneration. Phase 1 is typically a newer problem and easier to correct. 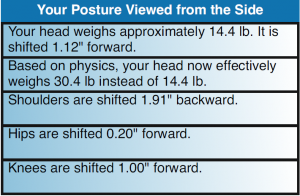 Phase 2 – Alignment issue with some changes to the vertebra or discs – Arthritis. In Phase 2 we know this problem has been going on for at least 10 years as it takes time for arthritis to develop. Phase 2 is still a phase where we can do a lot to improve function and slow down the degenerative process. Phase 3 – Unfortunately in phase three you body has succeeded in gluing the segments in your spine together. At this stage there is nothing we can do to improve the condition of the joint, but we can still work on the surrounding areas so that we can lessen the effect those joints have on the rest of the spine. Our goal is to find people that are in Phase 1 or Phase 2 as there is much more we can do to preserve the health of their spine. Based on a patient’s current level of health, their Phase of degeneration and their health goals we come up with a plan together so that we can improve function and quality of life. We all have the ability to live life and enjoy the things we want and need to do – pain free. It is our mission to help with that pursuit.